In this article, I'll discuss some key Brexit-related issues affecting the HR industry in UK. In a week when The Observer reported that the Bank of England predicts that up to 75,000 jobs could be lost in the financial services sector following Brexit, and The Daily Telegraph reported that The Study for the National Institute Economic Review suggests that UK families face hikes of up to £930 in their annual shopping bills if Britain leaves the European Union without a trade deal, the Financial Times’ London headquarters played host to a Business Briefing on Brexit. Intended for senior executives, especially those specializing in HR and related functions, the event was titled, 'Brexit revisited: Is it time for talent managers to act – or still wait and see?'. Moderated by Michael Skapinker, Contributing Editor and columnist on business and society at the Financial Times (FT) and Executive Editor at the FT | IE Business School Corporate Learning Alliance, the key speakers were Daniel Dombey, the FT’s Brexit Editor, and James Blitz, the FT’s Whitehall Editor. 12 months after a similar Brexit Briefing at the FT—one of the FT | IE Corporate Learning Alliance’s regular 'Business Briefings'—Brexit continues to be a concern for the talent community, despite attempts by the UK Government to begin fleshing-out the terms of UK-EU separation. Much has still to be resolved before action can be taken on strategic and practical HR issues, such as freedom of movement, and the retention of EU staff. Meanwhile, EU employees living in the UK are beginning to vote with their feet; the banking community is ambivalent about the future global status of London, and European capital city Chambers of Commerce are circling the City. The UK Government’s financial obligations to the EU. The status of EU nationals in the UK. "On the first issue, the EU wants 40 to 60 billion euros from Britain, while the UK is only offering some 20bn euros", said James. "There’s no obvious solution to the question of the border between Northern Ireland and the Republic of Ireland and little progress has been made on this issue – but there’s been progress over the status of EU nationals in the UK. Indeed, there are indications that the negotiating parties are close to a deal." James revealed that, while a deal on the UK’s financial obligations seems much closer than it was, this will prompt further technical difficulties over such things as the UK’s trading arrangements with the EU, and the transition agreement as the UK leaves the EU. "It’s highly probable that the UK isn’t going to get a free trade agreement with the EU before it leaves the Community", said James. "Such an agreement would take too long to negotiate. However, the UK may get some sort of offer over trade. The problem is that the British Cabinet is divided on this issue. Faced with this state of affairs, those in the HR world are likely to doubt if the Brexit Bandwagon will move forward any time soon." Daniel Dombey highlighted one of the key Brexit-related HR issues: the status of EU nationals in the UK once Brexit has occurred. He explained, "Brexit involves 3 key things: legislation; administration to implement the legislation, and negotiation. Most of the current concern relates to the transition arrangements". "The likely transition period after the UK leaves the EU means that, until, say, 2020/ 21, everything will operate as it has been operating. So, worries about what will happen in 2019 immediately the UK leaves the EU have receded somewhat", he said. “'What?' and 'When?' are key questions for Brexit,” he added. "There are currently some 3m EU nationals living in the UK and over 2m of them are members of the working population. A few years ago, that number was only around 500,000 but, now, there are around 1m EU nationals working in 'low skills areas' in the UK – notably in the hospitality, construction and food processing industries. "It seems unlikely that there will be any definitive guidance on their post-Brexit status until after September 2018", Daniel said. Pointing out that Britain has qualification rules governing the migration of skilled workers from non-EU countries, Daniel suggested that these rules are unlikely to change – even after 2021, when the transition period ends. In his view, any changes that are made to this system are likely to favour EU-citizens over non-EU citizens. However, there are no similar immigration rules for people with a lower level of work skills – yet some rules regarding these people need to be established before the UK leaves the EU in 2019. "Here", said Daniel, "there are some sources for reassurance but, as yet, no clarity". "Basically, we’ve not made progress. Decisions have been deferred. There hasn’t even been a debate in Cabinet about what sort of deal we want", he continued. "The approach by the British Prime Minister, Theresa May, seems to be 'tell us what you want, EU; then we’ll react'. This appears to have diluted the UK’s negotiating position". James added, "There’s good reason to be sceptical about the proposed transition period. First, two years is too short a time for such a period. Experts say that three to five years would be more realistic to make the post-Brexit arrangements work well. Second, Theresa May claims that the UK will leave the EU but that things will continue as before. However, that means creating a legal architecture to keep the existing customs and trade arrangements in place – and that will take more legislative time than exists". "The Government says that, starting in 2018, it can move the existing 3m EU nationals in the UK onto ‘settled status’ – giving them leave to remain in the UK – but can the Home Office process all these 3m applications before 2019"? Daniel pointed out that EU nationals who’ve been resident in the UK for five years have an existing right to remain, while those who’ve been here for two years or more can apply for 'temporary' status. Then, he said, there are those who are ‘new’ entrants to the country. He concluded, "There are lots of potential problems in processing all these people’s claims to remain in the UK". Michael Skapinker raised the issue of UK residents’ rights to access and move around the EU post-Brexit, especially for the purposes of work. He also asked whether, with the rise of the application of Artificial Intelligence (AI), the UK may need so many 'low skill' workers in future. Moreover, he said, faced with a likely reduction in the UK’s working population, as EU nationals don’t take up job opportunities in this country following Brexit, should this country be devoting more resources to up-skilling its young people via training program? Responding to a question from one of the delegates at the event—asking if there was a way of incentivising highly skilled people to remain in the UK—Daniel revealed that, in the last year, the UK has seen a 59% increase in emigration from the 'EU Eight', that is, the former Communist countries that are now members of the EU. Yet, he said, the UK still experienced net immigration of some 460,000 people in that year. "In other words, we have fewer people coming to this country – but they’re still coming", he said. “However, in the longer term, the Government is concerned to retain the highly skilled people and, so, must investigate what incentives it can offer them to remain after Brexit. Furthermore, in the short term, strawberries need to be picked—and old people still need to be cared for—so there’s still a demand for ‘low skilled’ migrant workers in the UK". In James’ view, "The UK Government is so focused on negotiations that it leaves the 'real world impact' of these affairs to take care of themselves". "Moreover", he said, "as net migration declines, this will change the Government’s view. This may, perhaps, play out via a more generous deal for EU citizens resident in the UK, along the lines favoured by the Chancellor of the Exchequer, Philip Hammond". Daniel added that 'delivering Brexit' means, effectively, ending the free movement of labor between the UK and the EU. He said, "For many people, this is the key issue of Brexit—even though figures show that EU migrants are net contributors to the UK economy and this is at a time when the UK economy is experiencing full employment. So, how can we expect to lose the EU migrant workers and then expect the vacancies this causes to be filled instantly by UK workers—without any difficulties?". "There are two views", Daniel observed, "One view is that the UK will have to 'skill-up' its workforce to deal with the shortfall in skills caused by an EU worker post-Brexit exodus. This is an aspirational view because it means creating a revolution in training and work as well as doing everything else!" "The other view asks, 'what does this mean in terms of economic models? ", he continued. "In other words, if the UK doesn’t get a deal with the EU, does the UK become the home of lower taxes and deregulation, especially in terms of workers’ rights? France, for one, is especially worried that this might become the case. Naturally, the UK Government denies that this will happen but future UK governments won’t be bound by the current Government’s view". "In the same way that 'a puppy is not just for Christmas', Brexit is not just for 2021", Daniel said. "It will take a decade or more for the whole scenario to play out". Agreeing with Daniel, James commented, "Brexit has been seen as an opportunity for the UK to get away from European 'red tape'. Yet, in her 'Florence speech', Theresa May said that the UK is keen to maintain regulatory standards and will not use the EU withdrawal bill to push through deregulation. Nonetheless, it’s difficult to know if this will be case in the long term". "Productivity is a key issue", James added. "The UK is about the be downgraded because its productivity has fallen over the last ten years. It’s going to take time for the UK to build up its exports with the 'rest of the world', such as the USA, Australia, New Zealand and so on, to a level matching the current level of trade with the EU". Summing up the current Brexit situation, Daniel advised, "Don’t panic. Only since the summer has it emerged that both the UK and the EU want a transition agreement". "Brexit presents problems for HR administrators rather for than the workers they administer,” he continued. “By 2021, any EU citizen who is now in the UK will have been here for some five years and, so, will be entitled to remain if they wish". "For EU residents who’re already in the UK, things are looking reasonably positive", agreed James. "However, the long-term future for the UK economy is more uncertain. It’ll take until at least the summer of 2018 to see any clarity on this issue. There are still lots of unknowns!". 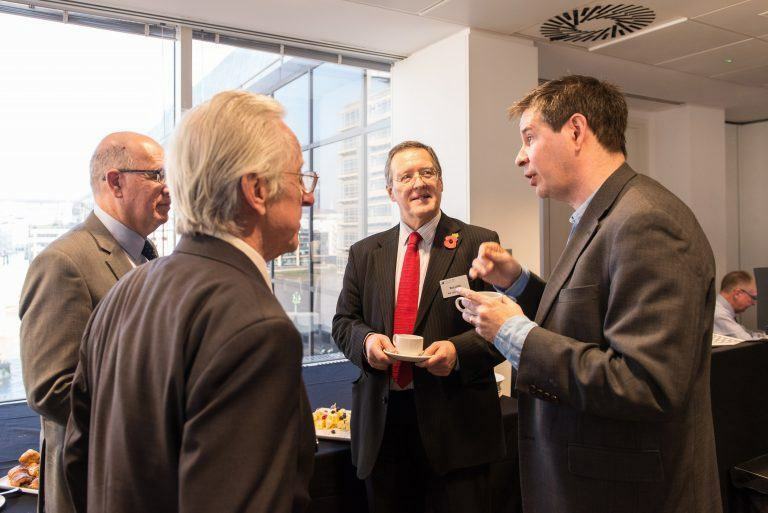 A video of edited highlights from the FT | IE Corporate Learning Alliance event is available.